Welcome to our 5-minute guide to diagnosing a faulty boiler heat exchanger. We’ll explain what a boiler heat exchanger is, discuss some common symptoms and faults, and explain how to protect it. After reading, you should get a good indication of whether you need a repair, or a replacement boiler. You can get repair quotes from local engineers here. 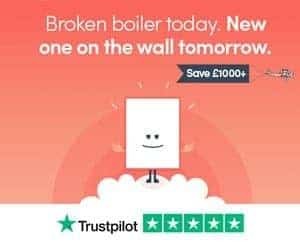 And, if you’re fed up with your boiler and would prefer a new one with a 10-year warranty, you can get an online price from BOXT (part owned by Bosch), extremely cheap. What Is A Boiler Heat Exchanger? First up. What is a heat exchanger? A heat exchanger in your boiler works by converting the energy (heat in this case) from gas, over to your water. Water passes through the heat exchanger in the boiler, heating up in the process. The water is fed into the central heating system via a “flow” pipe. It circulates around the heating system and returns via the “return” pipe. As the water passes through radiators, towel rails, and pipework, it loses temperature. And, as it enters the heat exchanger again, it’s reheated, and the process continues. 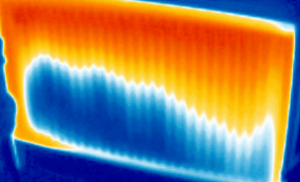 Like any part in a boiler, the heat exchanger can develop faults. Besides general wear and tear, there are two major things that cause heat exchanger problems. First, head over to this map. If you’re located in an area that is considered moderate or hard, there’s a good chance that limescale has built up on the heat exchanger. Limescale comes from minerals in the water that’s fed into the heating system. It can attach itself to radiators, towel rails and pipes. More importantly, it can attach itself to expensive boiler parts, like the heat exchanger. Heat exchanger faults then develop, and they are rarely cheap to fix. The first thing you might notice is unusual noises coming from your boiler. This is a sign of limescale build-up that has created a “hotspot” on the heat exchanger. The noise you are hearing is steam bubbles from the water being overheated. 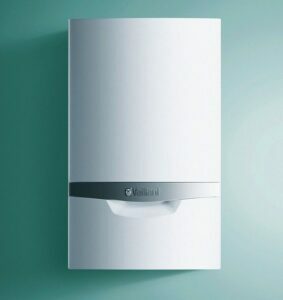 Your boiler is fitted with a NTC thermistor. The flow pipe thermistor monitors the temperature of water exiting the boiler. If this is too high, it will lock out. When a heat exchanger develops limescale build-up, the water can overheat. The thermistor recognises water temperature is abnormally high and shuts the boiler down. The hotspots created by limescale can eventually lead to cracks on a heat exchanger. This can cause the exchanger to leak. If this is the case, you’ll notice the boiler leaking from the bottom of the casing. Book in a professional to fix the problem here. Any heat exchanger fault is bad news. Heat exchanger repair costs can be £500 upwards. It rarely makes sense to spend that much cash on an old boiler. Hopefully, you’ve caught the problem early enough. Get an engineer to help. Use limescale silencer (such as Sentinel X200), this will breakdown limescale in the system as it acts like a cleaner. Fit a limescale reducer, this will collect limescale as it passes through the filter. Have the engineer inspect the heat exchanger. So, limescale comes from the water but central heating sludge comes from within your heating system. It’s the combined build-up of rust and dirt breaking off from copper pipes and joints, radiators and towel rails. This will create a blockage, and a fault with your heat exchanger. The noises that sludge build-up in a heat exchanger will make, are different to that of limescale. It’s more likely that the bits of rust are passing through rather than attaching themselves to the boiler’s heat exchanger. Just like limescale build-up, central heating sludge building up in the heat exchanger will cause a boiler lockout. But, it’s not usually due to water overheating. It’s more likely to be a “water circulation” fault. Essentially, bits of the heating sludge are restricting water flow. The heated water isn’t travelling around the system as quickly as it should be due to the blockage. If this is the case, it’s likely the temperature difference between the flow and return pipes is above what it should be, causing the boiler to lock out. If you’ve ever bled radiators, you’ll notice that after air is released, water is released. If the water coming out of the radiators is black, that’s a sure sign of heating sludge. And, that water passes through your boiler. It leads to a blockage. Limescale build-up usually leads to more severe boiler heat exchanger faults, than heating sludge. But, it’s still an issue that needs to be sorted as soon as possible. Inspect and clean the heat exchanger. Run a hot-flush, or power flush to remove any heating sludge. Dose the system with central heating inhibitor, this is will help to clean out the heating system. Fit a magnetic system filter, such as a MagnaClean Pro 2. Remember, with each annual boiler service, you’ll want to ask the engineer to clean out the boiler filter. The filter will only collect as much heating sludge as it’s body will hold. Once it’s full, the sludge will stay in your heating system, and find its way back to the heat exchanger, causing more problems. There’s unwelcome news when it comes to heat exchanger repair costs. It’s so expensive (in terms of both parts and labour), that it rarely makes sense to fix a boiler with heat exchanger faults. If the boiler is new (ish), it will be under warranty, so you won’t have to pay to fix it. If the boiler is old, there’s little point investing cash in a unit that is obviously deteriorating. How Much Does It Costs To Repair Or Replace A Heat Exchanger? Boiler heat exchangers usually crack when they develop faults. Repair isn’t an option, so you’ll need a replacement. Expect to pay anywhere from £350-600 for a new heat exchanger for your boiler. Need professional help? Get it here. Not prepared to invest that much cash in a deteriorating boiler? Get your online price for a new Worcester Bosch instead. Thanks for reading our 5-minute guide to boiler heat exchanger problems. If you have a question, leave a comment below and we’ll get back to you as soon as possible.